The Force is with her. She is one with the Force. 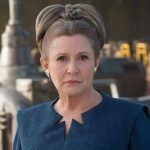 SPOILERS: Could a big mystery about Leia Organa be revealed in Star Wars Episode VIII? Building on what we saw in The Force Awakens? Princess Leia makes her big Star Wars: Rebels debut in the next episode! Princess Leia makes her big Star Wars: Rebels debut in the next episode! Sadly however, Carrie Fisher will not be voicing her… but we’re still giddy! Star Wars: The Force Awakens new round-up – Posters! News! Videos! Leia speaks! Several people have seen the movie! Poe Dameron gets a poster at last! FIRST LOOK: Is this Carrie Fisher’s Princess Leia in Star Wars: The Force Awakens?